When designing your Montessori classroom and choosing your Montessori furniture keep in mind the environment should emanate a beautiful home-like atmosphere. Anything that makes a classroom space feel institutional or sterile should be avoided. This means no educational posters, and not even a blackboard or a bulletin board are necessary because the Montessori method rarely requires a teacher to stand up in front of the class and teach a lesson to the group. Rather, children learn by doing. Montessori furniture should be laid out in an open plan that encourages children to move from area to area to learn. You should have plenty of natural lighting, preferably with at least two walls facing the natural outdoor environment. Windows should reach down to floor level, or at least low enough for children to be able to see out of them without straining. There should also be an open door to the (contained) outside area so children can go in an out as they wish. Instead of harsh fluorescent lighting, use soft floor lamps or table lamps to supplement the natural sunlight and make your Montessori classroom feel homey. As important as the way you organize your Montessori classroom furniture is the type of flooring you put under it. Whereas many schools have wall-to-wall carpet, the Montessori method encourages more realistic flooring underneath preschool furniture, such as tile or wood (or imitation wood), especially in the "practical life" area of the classroom. When cooking in a kitchen, a dropped pitcher would break on a wooden or tile floor. Since in a Montessori classroom, learning is supposed to emulate real life, children need to see the same results. Design elements in the Montessori school should look more like they would in a home than in a classic school environment. This means there should be a wealth of plants - small and large - around the classroom. Plants will soften the environment and make it feel cozy. They will also provide fresh oxygen to the classroom and provide practical learning activities for botany and practical life lessons. Instead of hanging a dozen of the exact same art projects on the wall, purchase real artwork or reproductions, or help your students matte and frame some of their own paintings. Also utilize solid wood furniture for displaying sculptures and other works, like you'd see in an art gallery or a museum - or a home. Hang or display artwork at child's-eye level so they can appreciate the beauty of it. 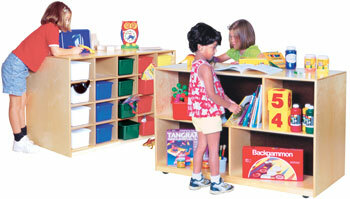 Preschool furniture in the Montessori classroom should be set out the way it would be in a home. The kitchen area should feel like a kitchen, with preschool tables and preschool chairs set out the way children would sit down for a meal at home. The library area should have plenty of comfortable, soft seating for children who want to look at books as though they would in their living rooms at home. Young children do a lot of learning and playing on the floor, so make sure to leave room around the preschool furniture for children to spread out on the floor. Provide mats (rolled up and put away when not in use) for children to sit on when they feel like working on the floor. Plenty of storage in the form of cabinets and shelving are also essential. As you can see, when laying out your Montessori furniture, your classroom design will be very different from that of an ordinary preschool classroom. The most important things to remember are that you lay out the room with an open, inviting plan and that your Montessori classroom furniture make your classroom feel warm and homey for optimal child-led learning.